Riding on unfathomable volumes of industrial expertise, we are providing a broad array of Orange Peel. We have Orange peel powder available. It is used as an ingredient in Face packs and skin care cosmetics. 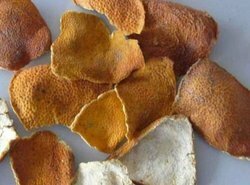 We offer dry orange peel for cosmetic use. oilcure Orange Peel Powder -150 Gms. Backed by a team of adroit professionals, we are manufacturing and exporting an extensive array of Orange Peel. Sameera orange peel is 100% Natural and chemical free, herbal and pure. Packaging Size: In cartons, Each Carton to contain 15 Kgs. i.e. 5kg x 3pkts inside the box (Nt. Wt.). Improves skin tone. Fights aging signs. Aids weight loss. Lowers bad cholesterol. Regulates bowel movements. Orange Peel is one of the major natural source of Vitamin C as well as antioxidants and pectin. As it is considered to be natural cleanser and astringent, it is widely used for cleaning the skin. 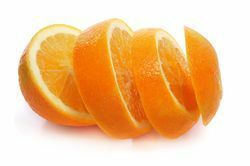 Orange peel maintain the natural balance of skin oils as well as refreshes and rejuvenates the skin. It is prescribed by skin specialists to tighten the skin and makes the person feel fresh. We take great pride in introducing ourselves as one of the fastest moving Freeze drying fruits, vegetable, herbs & Ready to eat product manufacuring company. Freeze dry Orange Peel is rehdrate with cold water, Orange Peel Healthy by Natural & with all Nutritional Value.